I have an existing form which has fields pretty close together. I want to get the error messages in a little popup instead of the regular lable beside the field. To be more precise, this is the style i want for my error message. Any clues on how to find the styles applied to the error message and how to change them? What you want to achieve is slightly more complex than simply changing the error class or message styles. Optionally, you can install another plugin that will create these tooltips for you. I use Tooltipster, but how you integrate the tooltip plugin depends on what methods are made available by its developer. Then you can absolutely position your error label and apply whatever other styles you like. 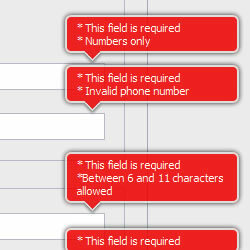 Edit: Those fields are set to digits only, so to trigger the error just put text into the fields. Error messages are handled via label elements with an additional class (option errorClass). This means if you follow the info in the previous answer you can have the error added in a div with class errorClass. Then just style those appropriately using css. Not the answer you're looking for? Browse other questions tagged jquery css jquery-validate .